“With Cubase’s flexibility I was able to set up a screen that had just what I needed on it," Kurek said. American composer Michael Kurek’s recent music has garnered critical and popular praise alike, not to mention been performed in 15 countries on five continents and broadcast on National Public Radio. His curriculum vitae brims with prestigious accolades including the American Academy of Arts and Letters’ highest-level lifetime achievement award. Earlier this year, his latest album "The Sea Knows" (Navona Records) debuted at Number One on the Billboard Traditional Classical chart, and stayed there for two weeks. Recording classical music conjures up images of high-end mics and preamps, large sound-stages, and sometimes esoteric and proprietary recording systems. Mr. Kurek, however, found that capturing the dynamic and harmonic subtleties of his lush neo-romantic style was best served by a tool used by thousands of musicians in all genres the world over: Steinberg Cubase. And while it’s forgivable to assume a classical composer might have luddite leanings, Kurek himself produced, edited, and mixed all five compositions on "The Sea Knows" in Cubase, “mainly because in classical I often don’t have the budget to hire someone to do this for me,” he laughs. He also tracked three songs by himself, and worked with acclaimed Nashville engineer Kevin Edlin on the string-trio “Savannah Shadows” as well as the fully orchestrated title track. Kurek’s choice of hardware for much of the recording process might surprise some readers. 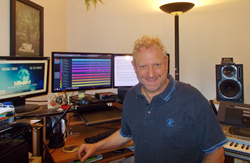 “The three duo and solo tracks — cello and harp, viola and harp, and solo harp — were recorded by me alone into Cubase using my very basic Shure SM58 mics. For the harp solo, I just had two of these and my Steinberg UR22mkII audio interface in the harpist’s apartment in downtown São Paulo, Brazil. Maybe these are the ‘wrong’ mics for this [application], but in Cubase I was still able to get the clear sound and end results I wanted. One might not think of the need for editing when one thinks of classical recordings, but in fact, the editing features in Cubase proved invaluable to helping Kurek realize the sounds in his mind’s ear. Above all, what Mr. Kurek finds most appealing about Cubase is that he feels he hasn’t needed to become a full-on “gear geek” to get excellent results: “I’m self-taught and have only learned what I need to know on the job, rather than having taken a comprehensive course in recording technology as one would at an engineering school. I haven’t needed to record a drum kit, so I have no idea how. But I have learned, for example, to edit the velocity of a virtual piano to get the sound I wanted for a mockup. It’s helpful now to make a virtual mockup of your classical music for conductors — and even for some chamber performers — to know if they want to do a piece that’s never been played before, to help them know the tempos, how long to hold a fermata, and so on. I tend to have a very specific vision of what I want and that informs my recording, of course. It also informs coaching the players in rehearsal for the live concert.